Trans tympanic delivery of drugs is gaining a worldwide acceptance and the indications are being expanded. In this context we are sharing our experience of drastic improvement in Sudden SNHL in a patient in whom oral and parenteral steroids were contraindicated due to existing diseases. A woman, aged 53 years, presented with sudden hearing loss in the right ear two days back, associated with severe tinnitus. After a thorough Ear, Nose, and Throat examination, including tuning fork tests, a Pure Tone Audiometry was done and a diagnosis of bilateral sensorineural hearing loss was made. On further questioning, she gave a history of hearing loss in the left ear, which started at the birth of her first child, when she was 23 years old. However, the hearing loss in the left ear also worsened since two days, with tinnitus. She is on treatment for diabetes mellitus and coronary artery disease since four years. She was given a transtympanic injection of Dexamethasone 1 cc (4 mg) on the right side on day one and 1 cc of the same in the left ear after 48 hours. 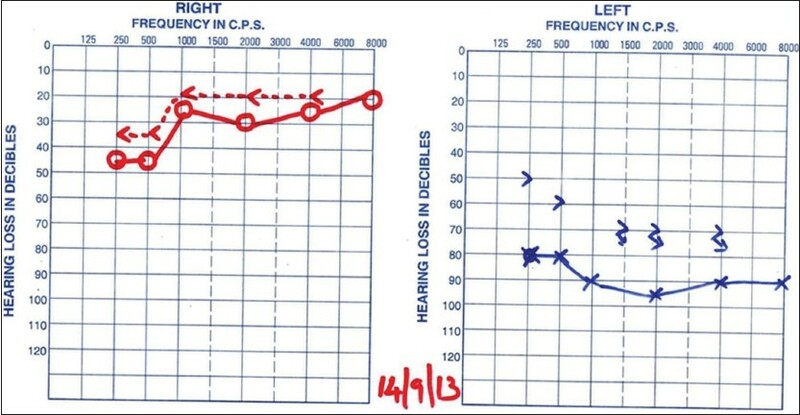 She felt a significant improvement in terms of hearing and tinnitus in the right ear and a moderate change in the left ear three days after the injection in the left ear. Two more doses of the same were given into the right ear at three-day intervals, after the first injection. She received three doses of transtympanic injection of dexamethasone into the right ear. 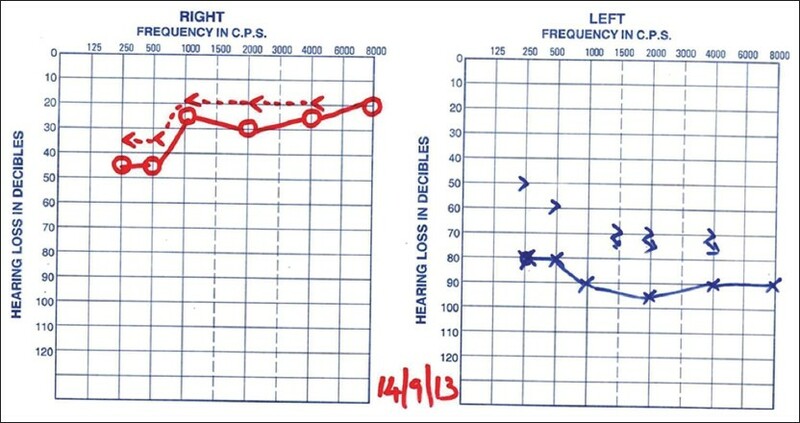 Pure tone audiometry (PTA) was done again after three weeks and eight weeks, which showed significant improvement in hearing in the right ear. Status quo was maintained in the left ear, as the hearing loss was of a 30-year duration [Figure 1] and [Figure 2]. Our experience of 90% hearing improvement in this case also adds to the supporting evidence gained from all over the world for transtympanic therapy. Transtympanic therapy is an attractive, convenient, and economical mode of administration of medicines that reduces the side effects associated with the oral or intravenous route, by providing higher concentrations at the site of action. It provides easy access to the inaccessible inner ear, while being noninvasive. Salt and colleagues have proposed that,  clearance of the medicine from the middle ear,  permeability of the round window, and  diffusion across the inner ear are the local factors that determine the delivery of the drug to the inner ear. The basic philosophy of transtympanic therapy is to achieve higher inner ear concentrations despite lower systemic levels. The medicines being used in this modality should have a wide therapeutic window and a low side-effect profile. Different delivery devices and techniques have been used, but injecting into the round window area, that is, the posterior and inferior part of the tympanic membrane, with a 26 G needle, with a tuberculin syringe has been found to be economical, easily reproducible, and associated with minimal side effects. The patient is asked to lie in a supine position with the head turned to the opposite side for one hour. The only precaution is to prevent entry of water into the ear for two weeks. There were no side effects reported and no anesthesia was required. Although transtympanic therapy has wide applications, it is being used efficiently in the management of Meniere's disease, sudden sensorineural hearing loss, and tinnitus of specific etiology. In the management of sudden sensorineural hearing loss by transtympanic approach, various protocols and various steroids have been studied. The rationale for use of steroids by the tyranstympanic route as a primary approach was a requirement for higher concentrations, with the avoidance of systemic complications and the perceived need to start TT therapy as soon as possible. However, the use of dexamethasone by injecting with a tuberculin syringe was found to be better, because it is easy to store (more stable) and does not burn like methyl prednisolone. Moreover, dexamethasone achieves a greater cochlear fluid concentration  if given by the transtympanic approach, without the associated side effects when given by oral or injection routes. Furthermore, very low doses of the drug provide the highest efficacy required. Individuals with contraindication to oral steroids can receive the injections alone, as in the present case. Transtympanic medical therapy is an appealing option for ear diseases, which provides the highest concentrations of drugs in the inner ear, avoiding the systemic complications that are associated with regular treatment protocols. We can avoid catastrophic and major surgeries, which are associated with huge morbidity. We hope that this method will benefit many patients in the long run, while formulating the best medicine, the best dosing regimen, and the end point of therapy while being applied to many more diseases in the course of time. 1. Salt AN, Gill RM, Plontke SK. A Meta analysis using mathematical stimulations of clinical drug delivery protocols. Laryngoscope 2008;10:1793-800. 2. Bird PA, Murray DP, Zhang M, Begg EJ. Intratympanic versus intravenous delivery of dexamethasone and dexamethasone sodium phosphate to cochlear perilymph. Otol Neurotol 2011;32:933-6. 3. Parnes LS, Sun AH, Freeman DJ. Corticosteoid pharmacokinetics in the inner ear fluids: An animal study followed by clinical application. Laryngoscope 1999;109:1-17. 4. Coelho DH, Thacker LR, Hsu DW. Variability in the management of idiopathic sudden sensorinural hearing loss. Otolaryngol Head Neck Surg 2011;145:813-7.